Question: Is there a concealed meaning according to the Kabbalistic perspective of the murders and atrocities described in the Torah, which seemingly take place according to the Creator’s command? Answer: Yes. The meaning of murders mentioned in the Torah is that we must kill the egoistic attributes inside us. This is the only thing it refers to, not to people. The Torah only tells us about what a person does internally, both good and evil. Therefore, the wisdom of Kabbalah is called the internal part of the Torah. Question from Facebook: What does the expression “vanity of vanities,” from Ecclesiastes by King Solomon, mean? Answer: “Vanity of vanities” is a mistranslation from the Hebrew expression “Hevel Hevelim,” proving once again that it is impossible to read the Torah in translation. In the wisdom of Kabbalah, Hevel means Ohr Hozer (Returning Light). This is great rule of the emission of Light when a person does not want to receive Light within his egoism, but wants only to resemble the Creator, he rejects it and sends it away. Only this measure still exists in the world and is manifested. Therefore, it is said that everything that happens in the world comes from what is called Hevel, the Ohr Hozer. This is not vanity but very serious inner work, quite the opposite of what we mean in our world when reading the Torah in translation. Question: If a person says about worldly pleasures, “all of this is vanity,” does it not have in mind some semblance of Reflected Light (Ohr Hozer)? Answer: No, this is enormous work a person performs on himself when he must make a Tzimtzum (Restriction) and then a Masach (Screen) to achieve a state of discovering the upper world, rejecting it, and sending it away from himself. Then, he sees that everything is perceived only in the Ohr Hozer. Thus, it is possible to receive pleasure only through the Ohr Hozer. This is the Hevel. Therefore, “There is none else besides Him.” Everything else is only talking about our world that is not considered to exist at all. Question: I love a woman and I want to study the wisdom of Kabbalah. The woman I love neither supports nor objects to this, but I have a feeling that she has a point in the heart. It could be that she hides it deep in her heart. Can I ask the Creator to strengthen and intensify the point in her heart so that we can advance together toward the Creator? How can I influence the Creator to impact her so that she will realize that our life together and the wisdom of Kabbalah are the most important thing to us and to the whole world? Answer: Spiritual development depends on one’s desire so coercion is impossible and forbidden, as one either has a desire or not. You should think about yourself and perhaps her desire will awaken through you. 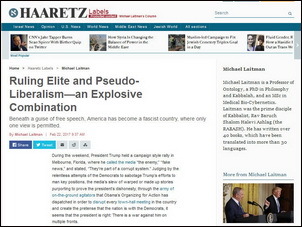 My new article: “Ruling Elite and Pseudo-Liberalism—an Explosive Combination” in my column in Haaretz. 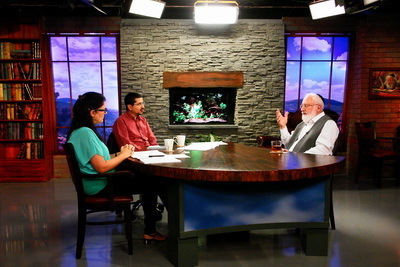 Question: You say that according to the Creator’s plan of creation, all will reach the completion of correction. Is it possible to predict the date when this happens to a particular soul exactly or close to it? It is very difficult to live with uncertainty. Answer: There is no such date. No one can know anything in advance. To reach the completion of correction, you must first define the goal, and the date will arrive when you create it for yourself. It is possible to predict the state of the beastly body, but it is impossible to predict the state of the soul since it depends only on the person himself, not even on the Creator. Question: It is said that negative emotions can cause illness. Is this true? Answer: In our world this is absolutely possible, but not in the wisdom of Kabbalah. In the wisdom of Kabbalah, emotions only purify the soul. This doesn’t mean that we must hold onto negative emotions, enjoy them, or become involved with sadomasochism, not at all in any way! We need to constantly try to be in positive emotions, not because we are afraid of negative consequences, but because that is how we express our desire to be in bestowal and love, like the upper force, which is good and does good. We want to be in such a relationship with the higher power so we can feel each other better. How can we enjoy life just as we did when we were kids? What rules of the game should we adopt in our daily life and what new world will be revealed in our lives if we play correctly? All of life is one big game. Everyone plays different roles in different situations. A young man and woman, for example, play a loving couple, but once they get married the game is over. Before the wedding, they did not feel committed, so they enjoyed the game. Once they have commitments, the game is over. It is impossible to enjoy life if there is no element of a game in it, no color. If that’s the case, life is death. Our life is supposed to be a game, a transition to a more sublime state, which is the attainment of a wonderful prize. But if we dry out our lives and hardly carry on, it becomes a heavy burden and we live since we have no other choice. In order to turn life into an enjoyable game we have to define the goal of life and the prize. Everything we achieve in life fades away and everything ends in death. This is why different religions have invented prizes that we are supposed to receive after we die. However, we can enter the wonderful game called “you shall see your world during your lifetime” right now. A person can break through all the boundaries and open the upper world for himself. According to the rules of this game, you should change your nature in order to open the new world for yourself. The instructions are simple: you have to change your attitude to others; to love others as yourself. You should play this game in a group of at least ten people. You should try to see others close to you as yourself until everyone melts into each other. In such a connection between us, we begin to discover one force, one thought, one desire—a new world. Everyone begins to play the upper force for others, to act the love and bestowal. We advance step-by-step until we reach the big prize—eternal life, not of the body but of the self.